In the ever-changing restaurant scene on Belmont Shore’s 2nd Street, the Japanese restaurant, Apengo, has recently been replaced by a new sushi bar, Sushi on Fire. Apengo had a really good fried oyster appetizer, so I was a little sad to see that it was gone. Chris and I decided to give Sushi on Fire a try and we were really glad we did. The old busy decor of the former restaurant has been transformed into an open minimalist space. The huge menu, as expected, is comprised mostly of nigiri sushi, sashimi, and sushi rolls. We started with the soft shell crab appetizer, which was crispy and delicate. It came with the ponzu dipping sauce, made with a Japanese citrus called yuzu and soy sauce. The Rainbow Roll (California Roll with shrimp, tuna, salmon and whitefish) was a solid choice, but it was nothing special. The Caterpillar Roll was definitely a much better choice, made with slices of barbecued eel and avocado toppped with a slightly thickened eel sauce made with sugar, mirin, sake, and soy sauce. This is one of the best Caterpillar Rolls I’ve ever had, thanks specifically to that terrific sauce. 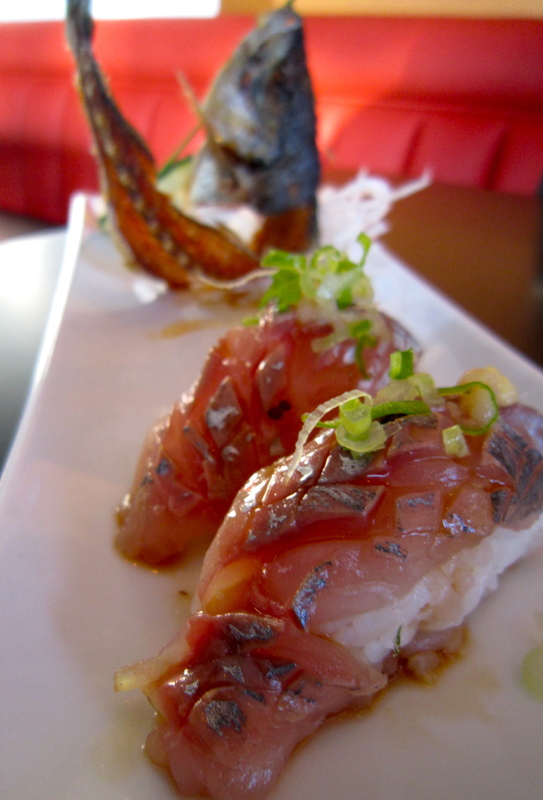 However, my favorite dish of the night was Sushi on Fire’s unique version of the Spanish mackerel sushi (photo above). The mackerel sushi was served with the traditional garnishes of fresh grated ginger and scallions to bring out the sweetness of the fish and a thin tart ponzu sauce to cut the rich aftertaste. In addition, the sushi chef deep-fried the rest of the fish, turning the bones and all, into a delicious crunchy treat. It was like eating potato chips. It was so tasty!!!! So, while I will miss the fried oysters at Apengo, the Spanish mackerel at Sushi on Fire definitely makes up for it.